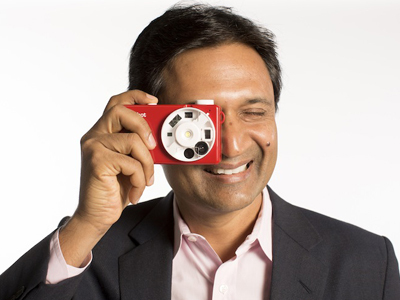 New York, April 13 (IANS) A team led by an Indian-origin professor at Columbia University has created a novel sheet camera that can be wrapped around everyday objects to capture images that cannot be taken with one or more conventional cameras. “Cameras today capture the world from essentially a single point in space. While the camera industry has made remarkable progress in shrinking the camera to a tiny device with ever increasing imaging quality, we are exploring a radically different approach to imaging,” said Shree K Nayar, computer science professor at Columbia University. “We believe there are numerous applications for cameras that are large in format but very thin and highly flexible,” added Nayar who graduated from the Birla Institute of Technology, Ranchi, in 1984. Nayar’s team designed and fabricated a flexible lens array that adapts its optical properties when the sheet camera is bent. This optical adaptation enables the device to produce high quality images over a wide range of sheet deformations. If such an imaging system could be manufactured cheaply — like a roll of plastic or fabric — it could be wrapped around all kinds of things, from street poles to furniture, cars, and even people’s clothing, to capture wide, seamless images with unusual fields of view. “The adaptive lens array we have developed is an important step towards making the concept of flexible sheet cameras viable,” Nayar noted. “The next step will be to develop large-format detector arrays to go with the deformable lens array. The amalgamation of the two technologies will lay the foundation for a new class of cameras that expand the range of applications that benefit from imaging,” he said. The novel technology is set to be presented at the international conference on computational photography (ICCP) at Northwestern University, in Illinois from May 13 to 15.